Hi! Grant suggested you guys might be interested in some of the fan productions that are out there that fit the Crimson Skies time period / genre. The ones that stick out in my mind are two audio drama series made by Pendant Productions a group that was started to make DC and Star Trek fan-made audio dramas in the style of "OTR" Old Time Radio. "Umket Industries Presents: The Dixie Stenberg and Brassy Battalion Adventure Theater" is an original, ongoing, monthly sci-fi serial adventure. "Indiana Jones and the Well of Life" is a feature-length adventure based on the Indiana Jones film franchise. Indy arrives in Paris for a meeting with an old friend, when Marion shows up unexpectedly. After enjoying a very special live performance, Indy makes a deal for a map, but the Germans have other ideas! Unfortunately board rules won't let me post the URLs but if you google "Pendant Productions" it comes at the top of the list and they are linked from their front page. Interesting, I do love the "old" radio shows. It struck me as a good idea. Radio drama's are interesting, but not quite my cup of tea. I like them, and would participate,etc. I am going to try and get practiced up on photoshop/photo program (A HUGE task for me ) and I may attempt a book with mass amounts of edited photos.....I doubt that will be a soon production, but it is an option on my plate. One of voices in my head writes about Star Trek fan productions and basically what they boil down to is that anything that the professionals can do, fans can do as well. It all started off with fan fiction and fan art but as technology boomed "The Common Man" was given the tools necessary to start creating more and more sophisticated work. Fan films, fan animations and fan audio dramas came from affordable equipment (digital cameras), software (Lightwave, 3DS, Blender, Daz, Audacity) and a distribution system that gets your work seen or heard all over the world for free - the internet. There are dozens of fan-made games in Star Trek alone, just have a browse through this list for some examples. Of course there are legal limitations that fan production groups have to live with. Contrary to popular belief the owner does not lose his rights if he doesn't sue everyone who infringes them. Different companies have different relationships with their fans: Lucas runs an annual fan film cometition, CBS/Paramount turn a blind eye as long as the groups don't overstep the mark but Disney is draconian in the way they will not allow any of their work to be used. I've even heard of them sending out "hit squads" of lawyers to check car spray painters to make sure they are not using their characters! Many computer game makers are now including the tools necessary to "mod" their games so that fans can create their own maps, vehicles, characters etc. Gaming is all about community and they've found that this strengthens the community, increasing market share and the longevity of the game. A franchise like Trek, Star Wars or Crimson Skies survives by bringing out new products or instalments in periodic waves. Fan productions keep consumer interest alive in their product between those "waves". Fan productions have been used by some fans (admitedly a very few) to break into the ranks of the professionals, they certainly make an excellent addition to a show reel or portfolio. Some sites have downloads of what they term as "abandonware", computer games that are no longer for sale and in some cases with untracable copyright owners because of companies going out of business or merging. Although I've never heard of a game being asked to be pulled from their lists, I've got to admit that abandonware is based on a pretty shakey premise. The FASA Star Trek gaming system isn't abandonware because CBS/Paramount still owns the IP for the Star Trek world and (I'm guessing) FASA still owns the rights to the material that they created whilst they had the license BUT certain game designers have released material they were designing when it closed up shop. The FASA Crimson Skies game seems to be in a similar situation. Microsoft own the IP for the Crimson Skies franchise but the board game copyright still rests with FASA doesn't it? I heard that the electronic entertainment rights to Crimson Skies have been licensed by FASA founder Jordan Weisman's new venture, Smith & Tinker. One growing field of fan productions is Machinima, which are animations made by using gaming engines. I wonder what would be needed to make a machinima based on the Crimson Skies universe? You could use the PC game to record aerial battles using something like FRAPS but you would need something to create the human-scale video, people talking, walking around, etc. Something like a WWI first person shooter game? I reckon that if Smith & Tinker made Crimson Skies add-on maps and props for "The Movies" as a joint venture, they would all make a packet and we'd have a ready-made tool for making our own animated movies! Grant wroteColon I am going to try and get practiced up on photoshop/photo program (A HUGE task for me ) and I may attempt a book with mass amounts of edited photos.....I doubt that will be a soon production, but it is an option on my plate. If you could get something that could do the close-ups you could do a webcomic like Laz Rojas' Elite Farce. Sir Robin wroteColon Interesting, I do love the "old" radio shows. I think Crimson Skies would be a great subject for a mini-series / series of audio dramas in the style of the Old Time Radio shows. I was really impressed with the way they did the the intro /cut scene movies on Youtube were great - are these from the PC game? As part of an assignment for class I storyboarded the audio short that is used in the installation program for CS. The next stage of that assignment was to turn it into a graphic novel [comic], I never turned it into a comic as my teacher wanted to disaude us from IP infringment. But seing as how I am not handing it in as an assignment I think I might give it a go. I am not agreeing to do a web comic, but I am happy to do a one off serial. And if it goes well I could easily turn it into n animated flash comic that runs in time with the audio file. foxmalcolm wroteColon As part of an assignment for class I storyboarded the audio short that is used in the installation program for CS. An animated flash cartoon? I'd be interested to see how you do that. A one-off is still a significant achievement and besides, I've seen groups burn themselves out by trying to keep to a schedule and push a good idea too far. I like the idea of a mini-series or anthology these days - gives you closure but there are always ways of building on them for those who want to continue. I can understand your teacher's point, he would prefer to see you 'push the envelope' with original work, not least because fan productions are not allowed in film festivals and competitions. My 16 year old son combined his love of World of Warcraft and Ancient History by using WoW and WoW Model Viewer to create a machinima of "The Death of Hector" that his class raved about. Igor wroteColon An animated flash cartoon? I'd be interested to see how you do that. It is easy enough to turn a comic strip into an animated comic strip, it would still read as a comic strip, one panel at a time but the contents of each panel would be animated. This has been done to great effect in comics before, like the Dark Knight. The trick with getting it to run with an audio script would be to break it up into series of sound events and scroll the related panels for each scene in a pre-timed order. To do this I would need to pull apart the audio file and isolate each sound event, whilst this is not difficult it is, fiddley, not to mention time consuming. But lets not get ahead of ourselves, first thing is first, I need to make the comic. And for the record, whilst I find the scripts that fans of Machinima use to be quite humourus, as a Digital Animator/Graphic Designer, I find it to be quite lazy and insulting. Don't get me wrong, learning to make an animation is not the simpilest of skills to learn, and that fans will use whatever tools are at their disposal, for that my hat goes off to their ingenuity. But it is still a mockery to something that people like me spend long years perfecting. It is sort of like how a deep sea fisherman probably feels when listening to the tall tales of a hobbiest fisherman telling his mates about some huge fish he almost caught down at the fish farm. OK I have had my little rant I'll be good now . 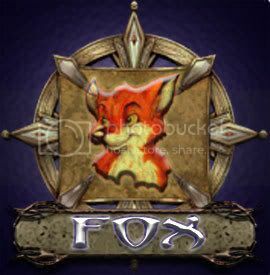 . . . .
foxmalcolm wroteColon And for the record, whilst I find the scripts that fans of Machinima use to be quite humourus, as a Digital Animator/Graphic Designer, I find it to be quite lazy and insulting. No offence meant, no offence taken. Its true that there are some fan producers and their fans who value their own work above that of professionals (especially in fanfic). However their attitude is more in tune with the DIY crafter in that they believe they can create something better which is tailored to their own needs and desires than a mass-produced item. What the best eventually realise is that to excel in their craft they have to emulate the professionals and learn by the accumulation of knowledge and experience how to use their tools. The vast majority though have the opposite attitude in that their amateur attempts build an appreciation for the skill and talent of the professionals. Its no accident that the highest profile Trek fan film, Star Trek: Phase II was started by a professional entertainer and costumer, James Cawley, Jack Marshall, who went on to work on the new BSG CGI, and industry legend Doug Drexler working under the pseudonym of Max Rem! I can empathise that, if you are used to building your own animations from scratch in Lightwave, watching the random movement of the characters generated by The Sims or The Movies (which I suspect share the same game engine) would be painful. Most people do it for fun in the same spirit as amateur theatricals or owner-building. Take game-modding for example. Individuals and groups might expend years of their life and thousands of their hard-earned cash in software to create a mod of a computer game that extends it in a direction that they want it to go. It might be a map that takes the storyline further, corrections to vehicle stats or house rules on a board game or building a role-playing game around the elements of a combat sim. Will this make the average fan say, "I don't need to buy any more professional games, this is good enough for me!" More probably the opposite! Should the seasoned screenwriter feel insulted that anyone can pick up a free copy of scriptwriting software and write their own movie? Or should the professional author take offense to the principle of NaNoWriMo, that values quantity over quality? Not at all because the person who attempts either of these things will actually gain a deeper appreciation of the professional's work, as will the average reader who reads their amateur attempts. The best examples I've seen which are similar to what you describe are Tony Tuthill's "Strange Grin" and the professional "The Legend of Gorath"
Sorry guys, I'll get back on topic with my next post.